One is a great article on Treblinka by Stephen Potyondi. Another, not so great "Revisionsm FAQ". With phrases like "resulting in at least 6 million Jews dead" (there should be no "at least" here; it would be correct if the figure of 5 million dead was used; this "at least" is quickly contradicted in the Q/A 10), and "[i]n addition, another 6 million non-Jews" (a widely spread myth, started by Simon Wiesenthal, about which we will write later) it can only mislead. The "final solution" was the attempt to physically annihilate all Jews under Nazi control. The reason it is called "final", as the Nazi documents attest, is that other solutions were attempted before this radical step was taken. The answer is formally correct - the "Final Solution" was murder, and it was final because other means had been tried before. But the reply is incomplete and therefore misleading. As is clear from the scholarly literature, initially the "Final Solution of the Jewish Question" meant "mere" deportation. And though it was also called "final", in the end it also turned out to be interim. I.e., it cannot be argued on a purely linguistic basis that the "final solution" meant murder. This is crucial for correctly understanding and analyzing deniers' arguments - and Nazi documents, for that matter. 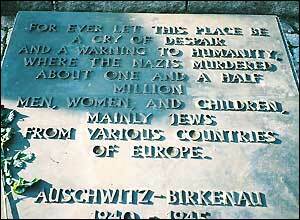 As an example, only about 7 Jews survived the Belzec extermination camp, although at least 550,000 were killed there. This, of course, contradicts the Hoefle telegram, according to which 434,000+ Jews were killed in Belzec. It is true that numbers like 500,000 and greater can be derived from witness testimonies and yizkor books, but now that we have the exact statistic, and in absence of the evidence to the contrary, only the Hoefle figure should be used. At the very least one should use the phrase "at least 434,000 were killed there" to be accurate. None. "Resettlement" meant deportation to, and death at, an extermination camp. Not necessarily in the extermination camp - Einsatzgruppen were also "resettling" the Jews in their own way, without the camps, and a minority of Jews actually were resettled to the "Eastern territories". He [Kurt Gerstein] visited Belzec with Professor Pfannenstiel and while there, witnessed a botched gassing van attempt where the engine refused to start for over two hours before the Jews could be gassed. What Gerstein witnessed was a gassing in stationary gas chambers, not gas vans. The correct number, estimated by the Auschwitz commandant Rudolf Hoess as early as 1946, is about 1.1 million, mostly Jews, and that is the number on the plaque today. The overall total of around 6 million is based on demographic studies and analysis of Nazi train records that record the numbers of Jews shipped to Auschwitz during its existence. An example of the methodology used is in Raul Hilberg's Destruction of the European Jews. Hilberg's best estimate is 5.1 million, which again contradicts the claim of "at least 6 million". Clearly, a revision of the FAQ is in order. Note that even the minimum figure is clearly above 6 million. It is correct to say that according to this particular estimate the number of victims is at least 6,000,000 - not that it is objectively such. Objectively we can only say that the number of victims is around 5-6 million (not excluding slightly lower or higher figures). Certainty has not been reached on the issue. Moreover, the internal contradiction remains. Either there are many differing legitimate estimates - as Q/A 10 correctly states (though not giving the correct range, as it does not really start at 4.8 million - Reitlinger's minimum is lower), or it is "at least" 6,000,000 Jews. If the latter is true, the lower estimates are no longer legitimate. Finally, the last paragraph refers to Hilberg's methodology, but in support of ~6,000,000 figure, while Hilberg has 5.1 million. This underscores my point - Hilberg did use the correct methodology, and he did reach the number significantly lower than 6,000,000, therefore certainty about "at least 6,000,000" is out of place.